A white LED light you attach to your golf disc! Retrofit the golf disc of your choice with this cool, white LED light. The Hole-In-One is designed to be permanently affixed to the center of any golf disc so you can play disc golf, and play, and play. This little bugger is a perfect replacement of glowsticks for glow disc golf. 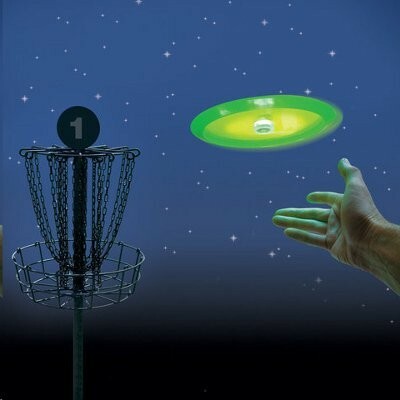 Play night disc golf well after dark - the bright LED glow allows you to locate your golf disc time and time again. Note: Innova Champion Disc NOT included - but we're certain you have an oldie-but-goodie somewhere in your disc golf bag that you can convert into a night-time instrument of fun! Security check: What is the sum of 4 and 1 ?